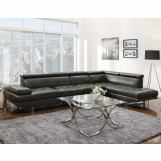 Create the sleek and modern look you have been looking for with our Piper sectional. Featuring a bonded leather match in chocolate or charcoal with contemporary styled steel legs, this collection is sure to impress your guests as well as leave them comfortable. Our Piper sectional is also ready to accommodate any size living room- just add an armless chair to create more seating. Each piece also features an adjustable headrest that provides more support and can add up to four inches to the back height.